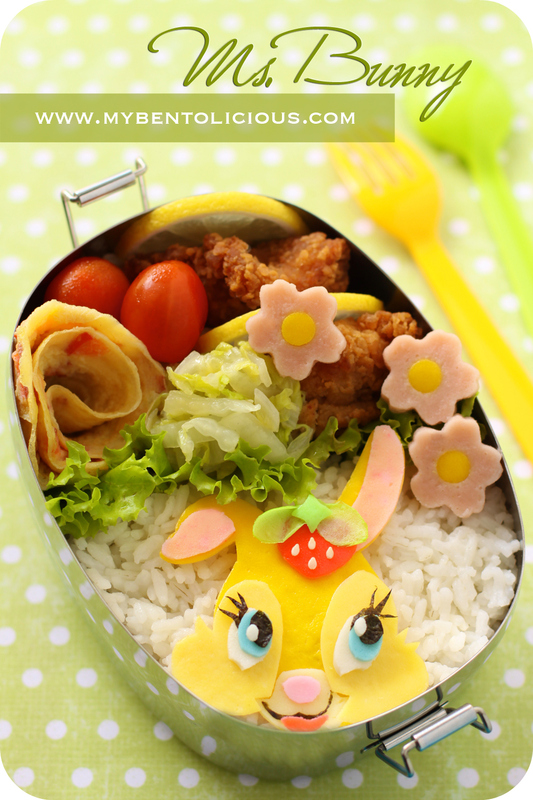 If yesterday's bento was in-between mouse and rabbit. I make sure without doubt that today's bento is really a rabbit. I made Ms. Bunny from Walt Disney's animated film Bambi. Inside the box : rice, red paprika omelet, stir fry Chinese cabbage, cherry tomatoes, lemon, flower shapes fish sausages, and chicken karaage. Okay, it is a very pretty bento, as always .. but I am more interested in your holiday destination! Sharee!! @Just a MOM : Thanks a lot Lin! Who say you can't. Before I thought I couldn't make a bento like this so I'm sure you can do it :) I would love to go to Hawaii someday. That is one of the dream holiday destination. But not for this time. US tourist visa needs 2 months or more to process. We just don't have enough time to apply. some advice from u,did you freeze your eggsheets for future use and how long can we keep them? @prince n princess mum : Thanks a lot! Look so girly, don't they? I always love your characters, and this one is no different! I love Thumper! Beautiful bento. I was wondering where you were going, then I noticed it was a secret for now! Looking forward to the reveal...hehe! yes, this one is definitely a bunny! such beautiful details in her face, love the eyelashes and cute strawberry with seeds! paprika omelette and karaage sounds like a yummy combination, too! sooo adorable. The blue of the eyes is very pretty! Can't wait to hear where you are going. I'm jealous already! She is utterly gorgeous, Lia--long lashes and bright sparling eyes. You are so very talented! I think my favorite detail is the perfect berry accent--wonderful! Congrats on your upcoming holiday plans! @Kelly Polizzi : hahaha ... I don't mean to make anyone jealous. I think I'm just too excited :) Thanks a lot Kelly! Hi lia! Very pretty bento as usual. =). me too, longing for a holiday, and a holiday after a holiday.. Hehe! Can't wait for your destination reveal n your pics! Take many many and share yeah? Cheers! So pretty and looks so much like the character, you are so talented at this! She is a beauty and definitely a rabbit! I would love to come and try out one of your amazing looking bentos one day - let us know if your holiday destination is Europe!! @dina : Thanks a lot Dina for your kind comment! Huaa....enaknya liburan. Kalo tebakannya bener dapet bento gratis gak?hahaha. Tebakanku antara ke Jepang, China atau Hongkong. I really enjoy looking at all the pictures of your bentos. Have a wonderful holiday! Oh my gosh she is so adorable! You are simply amazing with your creations! No snow? Lia, if you are coming to Hawaii I would love to meet up with you!!! I have missed so much! Your bentos are amazing as always. The details are just incredible and the food looks so yummy!